In my previous post we saw how easy it is to update a Boot Camp Windows installed on a MacBook to Windows 10, and how you can easily install the latest version of your Windows drivers provided by Apple. In this post I am going to focus on a different issue that annoys all of us who regularly switch back and forth between Windows and OSX, (you guessed it) Trackpad gestures and more specifically three finger drag-n-drop. It’s better than nothing, but it’s not good enough, I know. What if we had three finger dragging and all those cool gestures in Windows 10? Is it hidden somewhere? No, it’s not these options are simply not provided by Apple in it’s Trackpad driver for Windows, but don’t be discouraged you still have one possibility at this moment. Some smart guys have developed a free driver called TrackPad++ that makes it possible to have all those gestures and three finger dragging plus many more and it’s free! It’s actually a wrapper around Apple’s native driver. Take a look at their website for more information and instructions. Don’t be fooled by a not so beautiful UI in their app, it works like a charm and there is no annoying popup, ad or anything like that! You might even like to keep the first app as well, it will give you some extra options around power management, keyboard’s backlight, etc. 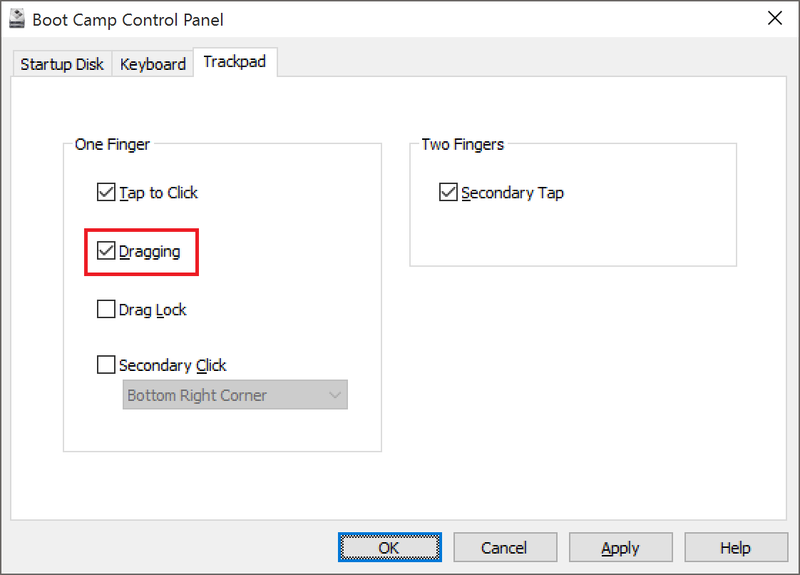 If only there was a driver designed for Windows precision touchpads like this, allowing 3-finger dragging on Windows, on PC Laptops (not just Macs running Windows via Bootcamp).